Educated at Victoria College. A premium apprentice at Swindon Works Great Western Railway. 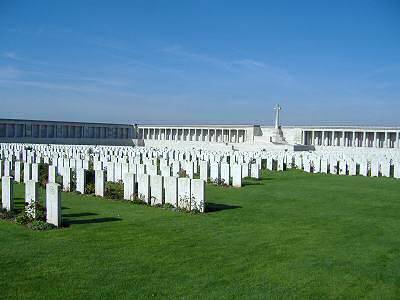 Lieutenant A B Grellier Wounded and Missing. 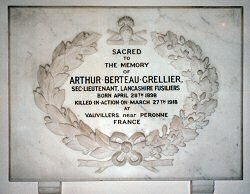 It is with sincere regret we state that late on Saturday Mr & Mrs A F Grellier of Bond Street received a telegram conveying the sad news that their only son, 2nd Lieutenant Arthur Berteau Grellier of the Lancashire Fusiliers, was reported wounded and missing on 27 March. Young Lieutenant Grellier was an Old Victorian and whilst a Premium Apprentice at the GWR Engineering Works at Swindon enlisted under the Derby Scheme, he being then 19. After training with the Artists Rifles OTC he was gazetted 2nd Lieutenant in the Lancashire Fusiliers and proceeded to France on 16 October of last year. The gallant soldier was keen on his profession and had evidently a promising career before him. He has scores of friends and acquaintances in the Island who will join us in expressing the hope that the parents will receive more favourable news in the very near future. Roll of Honour. Some months ago we stated that Mr & Mrs A F Grellier of 3 Bond Street had received intimation that their only son, 2nd Lieutenant A B Grellier of the Lancashire Fusiliers, had been reported missing. Since then the parents have been anxiously awaiting further news and needless to say this anxiety increased as the time went by and nothing of a favourable nature was received. Yesterday all doubts as to the gallant young officer's fate were ended by the receipt of an official letter which stated that the Military Secretary deeply regretted to report that the officer's name appeared in an official German list headed List of Dead, which had been forwarded to the War Office by the Geneva Red Cross. The list gave the officers name, rank and regiment and added that the disc was sent in by the Royal Prussian Headquarters on 12 May 1918 and that the owner had fallen but no further details. 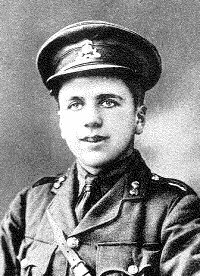 The late Lieutenant Arthur Berteau Grellier was born in 1898 and was at Victoria College from 1910-14, he had a talent for engineering and was placed as a Premium Apprentice at the GWR works in Swindon in 1915. He joined the Artists Rifles OTC under the Derby Scheme and was gazetted to the Lancashire Fusiliers in 1917. He left Jersey for the last time on 15 October 1917 and two days later was in France. From information received it appears that he was killed on 27 March 1918. We offer the bereaved family our heartfelt sympathy in their sorrow..